W.H.”Hoppie” “Billy or Bill” Hopkins, age 83 of Winchester and formerly from Springfield, passed away on July 12, 2016. He was born on October 6, 1932 in Fayetteville, TN to the late William Hathie and Gemella Elizabeth Hopkins. After graduation, Mr. Hopkins joined the United States Air Force in 1950 and served during the Korean War, spending 3 years in Tripoli, Libya and retiring in 1971 after 21 years in the military. Once he returned to Springfield, Mr. Hopkins owned Hops Grocery in Barren Plains for a few years and started to work at Tennessee Youth Development Center in Joelton. He worked for 24 years as a Correction Officer and met his wife Margaret, who was a nurse at the facility. Mr. Hopkins is also a member of Cross Roads Baptist Church. 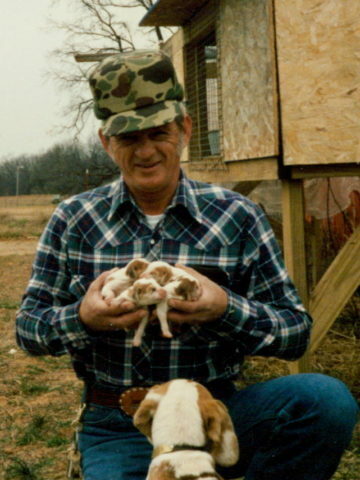 Mr. Hopkins had a love for raising beagles. Not only did he raise them but hunted, trained and even judged Field Trials. Some even nicknamed his place Beagle University. In later years, Mr. Hopkins would build himself a small shed in the middle of his property in Barren Plains and turn the dogs loose in the cool afternoons just to listen to them run. People traveled from miles just to spend time with Mr. Hopkins and his beagles. Even after moving to Winchester, Mr. Hopkins found friends who had beagles and they would go out when he felt good just to listen to them run. In addition to his parents, Mr. Hopkins is preceded in death by his beloved wife Margaret Hopkins, and son, Gary Wayne Hopkins. Mr. Hopkins is survived by his sons, Eric (Sylvia) Hopkins and Greg Hopkins; their mother, Margie Thomas; step-sons, Kenny (Brenda) Gorham and Michael (Becky) Gorham; 12 grandchildren; 34 great-grandchildren plus 1 on the way; 1 great-great grandchild; sisters, Agnes, Mamie, Juanita, Rita, Kaye, Faye, Patsy and Mildred and brothers, Alex, Howard, Donnie, and Ricky. A Life Celebration will be held on Saturday, July 16, 2016 at 10:30am in the Chapel of Springfield Funeral Home with Rev. Joe Hinkle officiating. Burial will follow in Springfield Memorial Gardens with Tim Sons, Wayne Andrew, Jeff Power, Steve Jones, Dennis Lane and Ronnie Jackson serving as pallbearers. The family will receive friends on Friday, July 15th from 4-8 pm at the funeral home. Love you Uncle Billy. You will be missed.